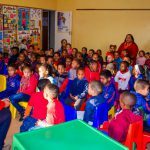 Miracle Kidz an organization in Constantia truly showed us the meaning of the word miracle. 13 kids are looked after at the home, and the kids are suffering from different traumas, as well as certain types of disabilities. All the children at the home have been rescued from abuse or dangerous and unhealthy circumstances. Elsie Du Plessis, the woman who runs the organization says she started this NGO, because she was raised by foster parents, and in foster care since she was a baby. She says she identifies with the children, who all call her mom, and is able to understand their struggles as well as find the right people to help them deal with their traumatic experiences. On the day; Clicks Helping Hands donated much-needed toiletries and detergents, and found someone to paint a mural in the children’s room. 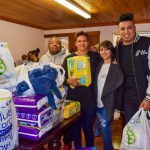 Sun international CSI also made a huge impact donating 15 thousand rand to the organization – while Ottery Baptist Church fed the children and gave them a box filled with presents and luxuries.